Olfactory bulb neuronal degeneration in a female B6C3F1 mouse from a chronic study. 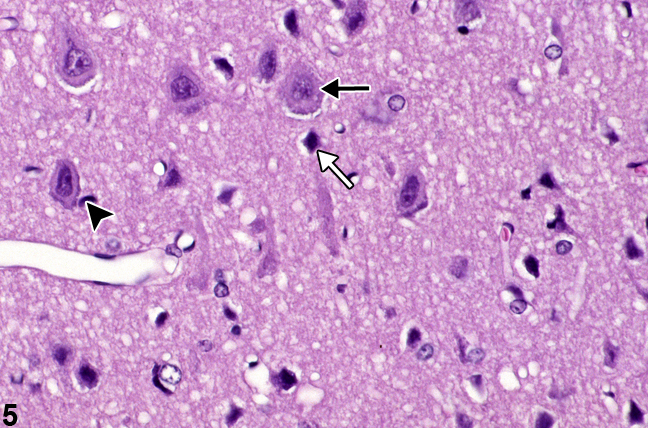 The arrow indicates the vacuolation and neuronal degeneration of the olfactory bulb. Gl, glomerular layer; EPl, external plexiform layer; GrO, internal granule cell layer. Higher magnification of the internal granule cell layer in the normal olfactory bulb in a female B6C3F1 mouse from a chronic study. The contralateral side shows the prominent vacuolation and neuronal degeneration. 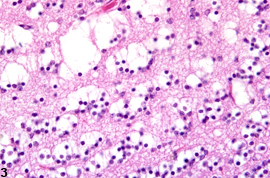 Granulovacuolar neuronal degeneration in a male F344/N rat from an acute study. 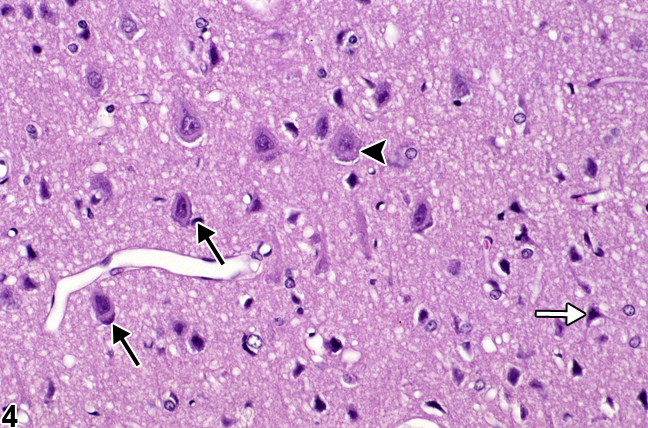 The black arrowhead indicates neuronal granulovacuolar change, the black arrows identify neurons with central chromatolysis, and the white arrow identifies a genuine basophilic necrotic neuron. 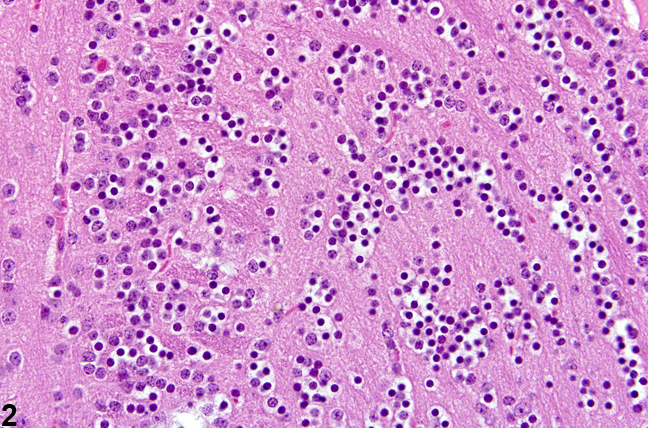 Granulovacuolar neuronal degeneration in a male F344/N rat from an acute study. 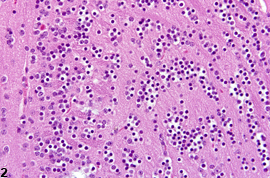 Higher magnification of Figure 4. 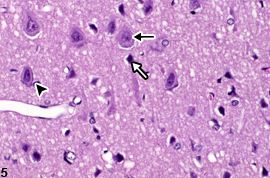 The black arrow indicates neuronal granulovacuolar change, the arrowhead identifies a neuron with central chromatolysis, and the white arrow identifies a genuine basophilic necrotic neuron. It is important for the pathologist to be aware of the various forms of subtle early changes associated with neuronal injury. These types of neuronal changes may be evident in animals receiving lower doses of the test compound, or in nuclei of the brain less vulnerable to the agent from higher dosed animals. Injury to neural tissue may involve one or more modes, such as vascular injury in which fluid accumulates in the neuropil, creating a vacuolated appearance of the region. Direct neuronal injury may involve the membrane and ion and fluid transfer, in which case vacuoles may become evident in the neuronal perikaryon. 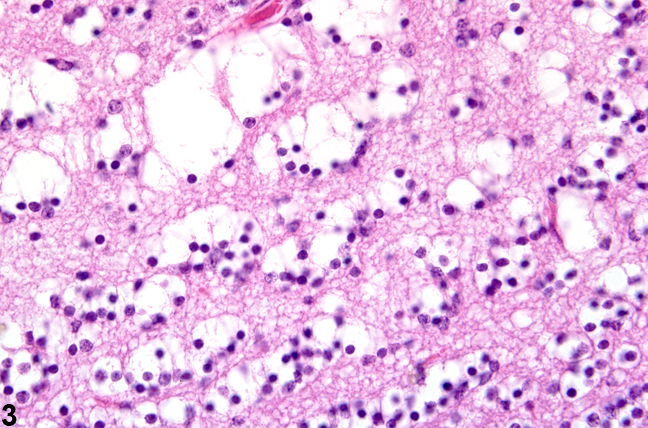 Commonly, the injury involves metabolic processes, particularly disturbances to neuronal energy production, in which case cell death occurs characterized by central chromatolysis, neuronal necrosis, and ultimately lysis. 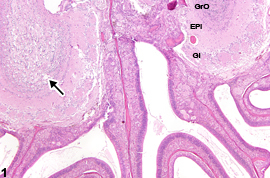 Figure 1 , Figure 2 , and Figure 3 , at low and higher magnification, depict degeneration of internal granule cells of the olfactory bulb. Note that the change in Figure Figure 1 is worse on one olfactory bulb (arrow), with degeneration and loss of neurons, as well as rarification of the entire bulb structure. The contralateral olfactory bulb is divided from its affected counterpart by a thin osseous plate, and the posterior portion of the olfactory mucosa is present ventrally. The structure of the contralateral olfactory bulb provides a good comparison in Figure 1 and Figure 2 , having a normal glomerular layer, external plexiform layer, and internal granule cell layers. Close observation of the olfactory bulb for lesions is important in toxicologic studies, even if the compound is not delivered by the inhalation route. 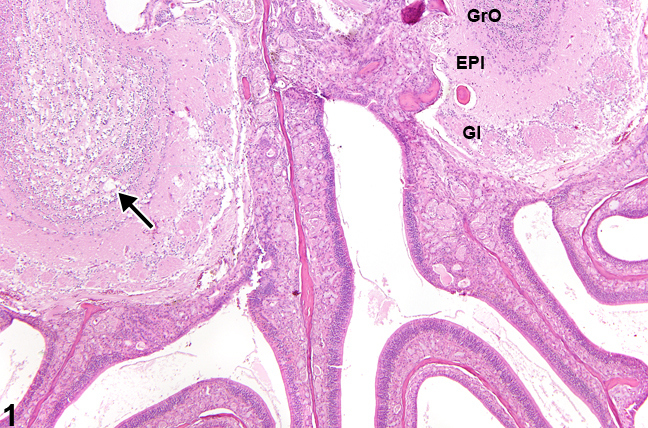 The necrotic and degenerative changes of granule cells of the olfactory bulb have a morphology similar to that seen in granule neurons in other sites, such as the granular cell layer of the cerebellum. Figure 4 and Figure 5 depict a commonly overlooked subtle and early form of neuronal injury known as “granulovacuolar change.” The perikaryon is slightly swollen and contains small vacuoles and granularity (arrowheads), suggesting membrane injury and distension of the cytoplasmic organelles such as the endoplasmic reticulum and mitochondria. 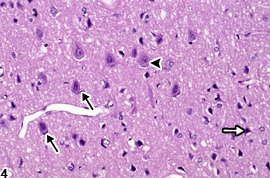 In these images, it is accompanied by other ancillary evidence of neuronal injury, such as central chromatolysis (black arrows) and genuine basophilic “chronic” nerve cell change (white arrows). Various stages of neuronal and astrocytic degeneration as documented by light and electron microscopy are available in a sequenced study by Cavanagh et al. (1998) of the effects of a mycotoxin on the rat cerebellum. When present, neuron degeneration should be diagnosed, the subsite noted, and the severity graded. In the presence of concurrent lesions, lesions with the most severity are typically diagnosed. Other concurrent lesions may be diagnosed separately, if warranted by the severity. Cavanagh JB, Holton JL, Nolan CC, Ray DE, Naik JT, Mantle PG. 1998. The effects of the tremorgenic mycotoxin penitrem A on the rat cerebellum. Vet Pathol 35:53-63. Colman JR, Nowocin KJ, Switzer RC, Trusk TC, Ramsdell JS. 2005. Mapping and reconstruction of domoic acid-induced neurodegeneration in the mouse brain. Neurotoxicol Teratol 27:753-767.